Everyone can safely agree that owning a bicycle instead of a car saves a lot of money spent on gas, insurance, and so on. But, unlike with a car, commuting on a bike can be exhausting, leaving the rider a sweaty mess once they get to work or school. But what if there’s a bike that offers all the benefits of eco-friendliness and cost-saving minus the sweat-inducing pedaling? Here’s your introduction to the best electric bike. As the name suggests, these bicycles have semi-auto or fully automatic pedaling, so that the rider can cycle without actually feeling exhausted. Imagine riding up a hill and arriving at your destination without breaking a sweat! Electric bicycles are excellent investments for those who are priced out of automotive vehicles. Thanks to the automation system, these bikes can move faster than the pedaling ability of some riders, thus effectively substituting as a convenient mode of transportation. This e-bike has a quick release battery and world-class quick change Shimano gears. On normal terrain, it can reach up to 15mph speeds and travel continuously for up to 28 miles. What more could you have with one of the best electric bikes? The Power Plus CX1 comes with a battery upgraded to 36V, so the performance is nothing short of incredible for the price range. Oh, and the vintage silver frame is eye-catching and stylish, so you won’t look like an old hippie riding this one. The frame design is based on mountain bikes for smooth and reliable rides. Like most mountain bikes, this comes with Kendra tires, front suspension, and a padded saddle that won’t make your bum sore on the way to work. The well-built design has zero plastic in its components. It can reach high gears up to level 7 so even riding uphill is a breeze. The bike is very heavy though, which you will feel when riding manually or in the assisted pedaling mode. Lugging this in and out of the house or apartment would definitely give your upper arms a workout. The battery indicator can be a bit imprecise as well, so always calculate the remaining charge very conservatively. If you are looking for a machine to add some serious power and speed to your ride, then this bike will definitely be the one that you should choose. See, equipped with 250W brushless gear motors, you will have no trouble at all getting up to around 15 miles an hour on the road. So, regardless of your destination, you will have no problem getting there as fast as you need to. The powerful 36V lithium battery also adds to the power of this electric bike. Thanks to it, you can travel between 15 and 30 miles, depending on the mode that you have chosen. Now, speaking of modes, you can select from e-bike and assisted bike mode so that you can maximize either speed or distance. Adding to this is the 21-speed transmission system and the smart 3-speed meter that makes it a breeze to select which speed you are traveling at. There is also no denying that this is a hardy bike as well. It is made from a durable aluminum alloy, ensuring that this is a bike that can stand up to the trails without any problems. Now, that being said, this is a rather hefty bike and so, it can be difficult to ride up inclines. The upshot of this, however, is that it has a greater load capacity and can support most riders with ease. This is one of the most affordable e-bikes we found available online. It’s super eco-friendly and is priced low enough for even a college student to afford. Despite the low price tag, this e-bike is quite powerful and extremely well-built. It comes with a 36V, 10Ah, removable Li-ion battery and a 250W brushless motor. The Shimano gear set has 6-speed levels with maximum speed up to 20mph. With the semi-auto pedal assist, a rider can comfortably travel for up to 35km. Plus, the battery charger is UL approved. The motor kicks in with the pedal assist too. The bike has an inbuilt variable speed throttle feature that allows riding for hours. The range can depend on weight and terrain but reaching 20 miles is not difficult. Saddle height adjustment. The rider can adjust the quick release saddle for the most comfortable position without having to go to a bike mechanic. While the main components are great, some of the accessories, like the basket and the kickstand, are very cheaply made and won’t last long. The original tires are annoyingly prone to punctures as well. And it comes with a bizarre instruction manual that doesn’t make sense. Otherwise, the frame and motor are good. Literally a green bike, this e-bike is foldable, well-made, sturdy and can travel long distances. It has a 350W motor and a 36V, 13aH lithium-ion battery. The battery model is Samsung, the smartphone producer, and it charges really fast. 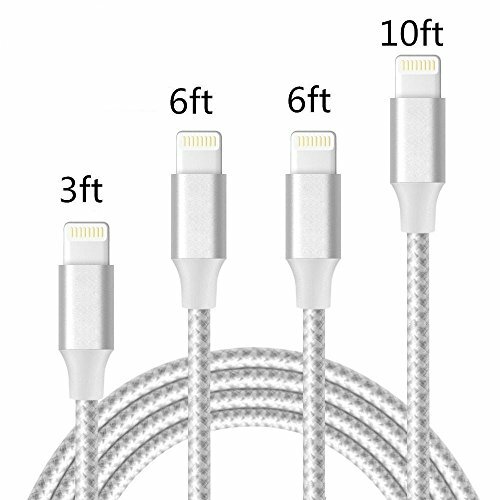 It’s mostly enough to charge this overnight and leave it at that. On normal terrain at average speeds, this e-bike can cover about 50 miles on a single charge. It can reach speeds up to 20mph. This bike comes with Kendra wheels that have puncture-resistant tires. For a change, we didn’t feel the need to replace the original tires. The hybrid e-bike also has a full-suspension mode so rides are smooth and comfortable even at high speeds. The assisted pedaling mode can reach up to 28mph. The frame is foldable so you can carry the bike on buses or trains and store it without taking up too much space. There are many other mini perks like a free storage bag, a phone holder, and an LCD display that works even at night. The LCD display can control the front and rear lights. We loved the wide handlebars as well. Packing a Shimano gear set, the GB5 proved to be an extremely reliable ride. One disappointment was the slightly high price tag. Are you looking for a bike that you can ride in any weather conditions at all? Or maybe, you want a bike that can handle various terrains. Well, regardless of which one of these features you are looking for, you will find that this is the electric bike for you. Now, as you can imagine, a good deal of this bike’s prowess comes from the fat tires as they boast anti-skidding properties. Thanks to this, riding in sand, snow, and virtually any other landscape is an absolute breeze. Of course, there are a lot of other factors at play here. 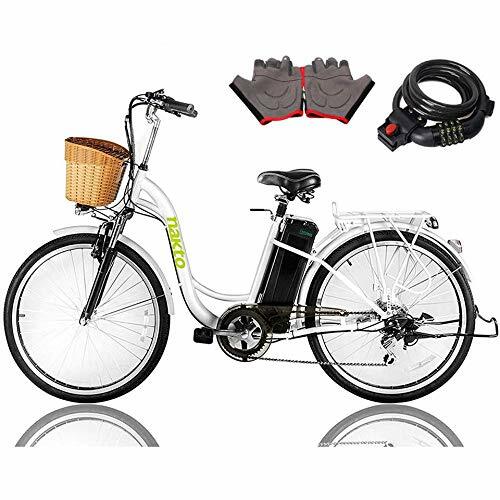 This includes the 500W gear motor that allows you to get up to 23 miles per hour without even breaking a sweat. Then there is the fact that thanks to the pedal assisting, walk assisting, and hybrid cycling options that you can select from a variety of ways to use this bicycle. In fact, riding this bicycle, in general, is quite easy due to the Shimano 7 Gears Shifting System which makes the bike rather simple to maneuver. You will also find that this bike accepts a wide variety of riders as it has a load capacity up to about 260lbs. The only downside with the settings of this bike is that the display and settings are a bit basic, limiting how you can change them. Buying an electric bike is not too different from buying a regular bike. Prospective owners should look for specs such as the type of bike, gear speeds, wheelset, frame, and other features riders need in a bike. The only difference is that e-bike buyers have to check the durability and reliability of the motor and the battery back. Hybrid e-bikes are just like regular bikes. These bikes combine two functionalities, such as the ability to commute on roads with the ability to mountain climb steep trails. When it comes to e-bikes, hybrid means having a motor and a frame that can be folded for carrying. Fat e-bikes can ride on soft surfaces where other bikes would sink. For example, think snow or beach sand. Most bikes cannot be ridden on such surfaces. However, fat bikes have wide tires with low air pressure, making it possible to ride on terrain that would sink other types of bikes. Most e-bikes are designed to commute on flat roads. Mountain e-bikes are simply the motorized version of mountain bikes. 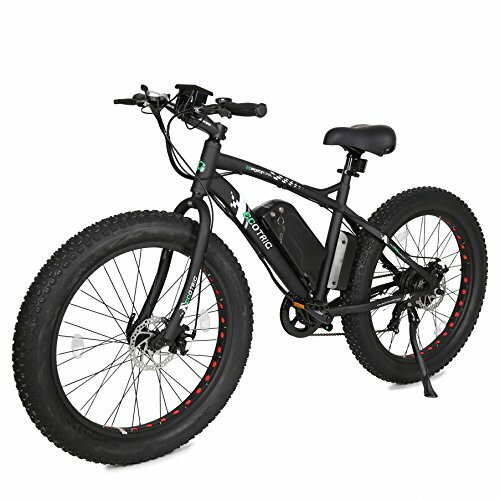 If you want to ride your e-bike uphill or downhill, you will need a mountain e-bike. These models have powerful motors, brakes, and gears that can handle sloping terrain, unlike regular e-bikes. Some e-bikes are fully automated, meaning that the bike doesn’t require any pedaling at all and can ride on with the rider only maneuvering. Pedal assist bikes require manual pedaling, but the motor will offer some support. Therefore, the rider can reach higher speeds or cycle without getting exhausted as usual. It’s a bit like having training wheels that can push the bike forward. Obviously, what distinguishes e-bikes from typical bikes is the presence of the motor. This is the part that gives the bike the electric assist, so the rider doesn’t have to pedal hard, or at all. The power of the motor is determined by the wattage. The higher the wattage number, the more powerful the e-bike is. The placement of the motor can have practical concerns as well. For example, if the motor is placed under the frame facing the road, you might not be able to drive over puddles that might splash water on the circuits of the motor. 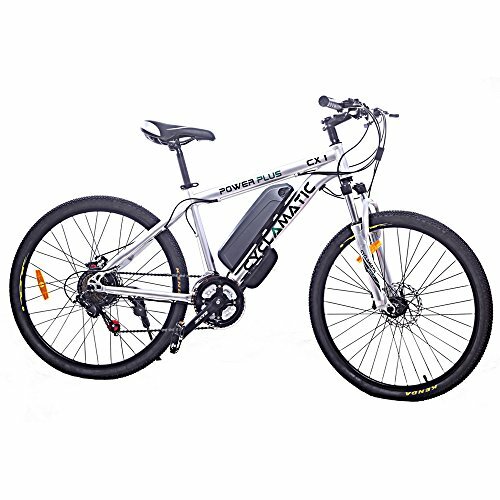 E-bikes do come with different motors that can vary in performance, power, and durability. Most of these details are very technical and difficult to understand for the typical buyer. Brushed and brushless motors can have a bearing on the price and the power of the motor. Brushless motors are more energy-efficient than brushed motors. Brushless motors are also quieter and long-lasting. At higher voltage levels, brushless motors can become overheated, whereas brushed motors don’t have this issue. Therefore, it’s very important to look for a speed controller when buying an e-bike with a brushless motor. Brushless motors are more common in e-bike models because of the efficiency levels that bring the overall prices down. The battery powers the motor, naturally. E-bike batteries function in very similar ways to smartphone batteries. They have voltage levels and capacity. The voltage level generally indicates how much max power the battery can provide to the motor. The capacity is determined by how long the e-bike can ride on a single charge. This can vary depending on the territory, the weight of the rider, the model, and other factors. Nearly all e-bikes come with lithium-ion batteries that can be recharged, just like smartphones. E-bikes that are ridden every day should be routinely charged. Just like smartphone batteries, the Li-ion batteries in e-bikes get worn out after a while. In that case, you will have to replace the battery. The frame matters to e-bikes just as this part matters to regular bikes. The material the frame is made of can determine the durability and the weight of the frame. If you want a lightweight bike that is easy to ride and carry, buy a full alloy frame bike. Carbon steel frames are heavier, but are more suitable for certain types of riding like speeding. The frame height can determine how comfortable the rider will be on the bike. Keep that in mind when buying online. The most important determination should be given to the motor and the battery. What type of motor does the bike have and how long can the battery last? Check the overall weight the e-bike can carry, especially if you are a large adult. Pay attention to the wheelset and the type of bike. You will require different types of wheels and frames depending on the territory you plan on cycling mostly on. List your requirements before you settle on an e-bike. After all, there’s little point in buying a mountain bike if you only need an e-bike to commute on a road. Brushless motors are highly recommended for first-time e-bikes because of high levels of efficiency and low cost. But make sure the bike model has a speed controller to prevent overheating. Check if the bike offers fully automatic pedaling or only pedal assist. With the latter, you will have to manually cycle with the electric assist boosting speed and the exerted force. When buying an e-bike, always consider the range, motor type, and the bike type. If you want a low-cost e-bike, you can choose a well-reviewed model like the Nakto e-bike. If you want a frame that can support a heavy rider, you will need a model like the Addmotor Motan. The terrain you travel on will matter too. 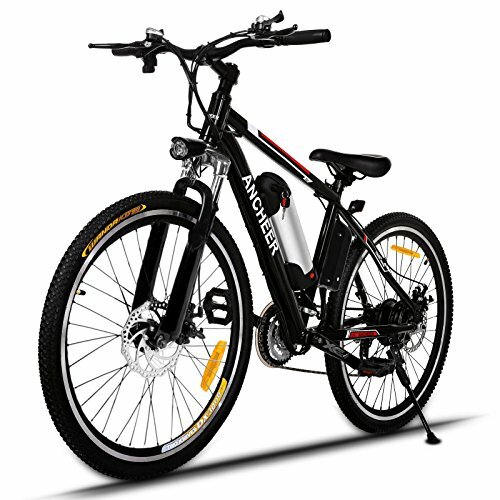 For example, if you need a powerful e-bike for uphill rides, choose a model like Ancheer. Foldable hybrid e-bikes offer additional conveniences, especially when you need to carry the bike on your commute. In this case, a model like Greenbike will be best. The best e-bike is the bike that matches your needs. So are you ready for your first e-bike?